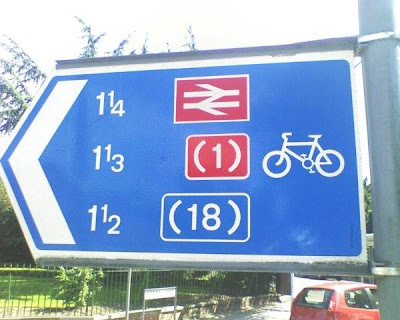 Much as I applaud the concept, the implementation of the National Cycle Network signposting is at times atrocious! The fundamental problem is that the signposts are useless unless you have a fairly good working knowledge of the area, bearings and ideally a TomTom Navigator! Furthermore time after time one follows a road signposted as a cycle route, only to come to a junction with no markings whatsoever. It's worse than no information at all! Rather pleasingly, on my last cycle up from Whitstable, I came across the Thames and Medway Canal, a disused route between Higham and Gravesend. Perfectly flat, it was originally built around 1800 to connect Deptford and Woolwich Dockyards on the Thames with Chatham Docks on the Medway. It runs along a firing range, which had the red flags up as I rode past, although my concerns about major artillery throwing me off my bike were allayed when I heard occasional pops of rifle fire. It's also very pretty - being disused there are lots of rushes growing in the water, and a fair amount of small wildlife too. 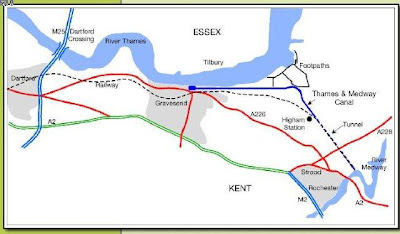 Unfortunately for cyclists, the key bit of the route, the tunnel from Higham to Strood, which would skip the enormous hill above Rochester, is used by British Rail and so is not an option. Still, the rest of it is a very nice ride along the graveled towpath, and I shall we going that route next time I cycle to Kent, possibly using the Tilbury ferry to come in to London a different way too. Weekend cycle ride with Will was to Oxford. We slightly underestimated how long a 75 mile ride along the Grand Union Canal then over the Chiltern Hills with a mild headwind for most of the journey would take. Suffice it to say that cycling back was not really an option, and I'm still feeling slight pangs in my upper legs a day later! There were, I am bound to report, some very nice-looking pubs, especially from Marlow onwards, but we sadly did not have time to visit.. this time.